Technical officers from different Pacific atolls met in Kiribati for an intensive week of training and knowledge sharing to improve their capacity to support the water security of vulnerable island communities. 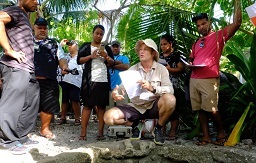 The one-week Atoll Water Security Workshop was convened by the Pacific Community (SPC) in South Tarawa, an urban atoll community all too familiar with the impacts of climate variability on household water security. Participants from the Cook Islands, Tuvalu, Tokelau, the Marshall Islands, and Kiribati spent time discussing the water security challenges facing their countries, and some of the solutions that are already being applied on the ground at the national and community level. In opening the workshop, Kiribati Minister for Public Works and Utilities, the Hon Ruateki Tekaiara, stressed the importance of atoll countries sharing knowledge in their efforts to strengthen resilience to the water-related impacts of climate variability and climate change. “It’s gratifying to welcome representatives from our neighbouring countries who face many of the same difficult water security challenges as Kiribati,” he said. “As atoll nations, we have a unique perspective of the challenges in securing our drinking water supplies and by sharing our collective experience, we can improve our responses to the difficult water security issues that affect us." The workshop comes at a particularly critical time for several of the participating countries. For the Republic of the Marshall Islands, which is entering its third month of a drought State of Emergency, information gathered at the workshop was particularly pertinent. Paul Alee, RMI’s National Water Security Officer, feels that the lessons learned during the training will be highly relevant in efforts to addressing water security back home. “Unfortunately some of our key actors in water security could not attend the training as they are busy coordinating our Government’s drought response” he said. “However, for those that could attend it’s been a great opportunity to share our own experiences with the region’s other atoll nations, and also to see first-hand some of the great water security initiatives underway in the region, and particularly in Kiribati”, Mr Alee added. The workshop was supported by the Government of New Zealand through the Strengthening Water Security of Vulnerable Island States project implemented by SPC. Joining the Minister in welcoming participants, New Zealand High Commissioner to Kiribati, Michael Upton, highlighted the value of sub-regional collaboration in tackling common challenges such as water security. The five-year project is assisting national governments to work with island communities to develop, demonstrate, and share practical measures to better anticipate, minimise and respond to the impact of drought. The training workshop included practical training and knowledge sharing in areas such as: remote island drought assessment; groundwater and water resources monitoring; drought anticipation and triggers; drought management plans and responses; and spatial data tools for water security. Interactive technical modules were delivered by SPC and participating countries, with input from partners including UN-OCHA, UNICEF, NIWA and IFRC. The workshop also included the project’s regional steering committee, in which countries reported on progress and participated in project governance. Speaking at one of the training sessions, SPC Water Security Project Manager, Uatea Salesa, acknowledged the importance of effective communications in maintaining water security.